Deploying the configuration described by a managed cluster, datacenter, or node pushes a configuration profile, or updates to configuration profiles, to designated targets. When Lifecycle Manager (LCM) deploys a configuration, it overwrites any configuration changes that were not made within LCM. 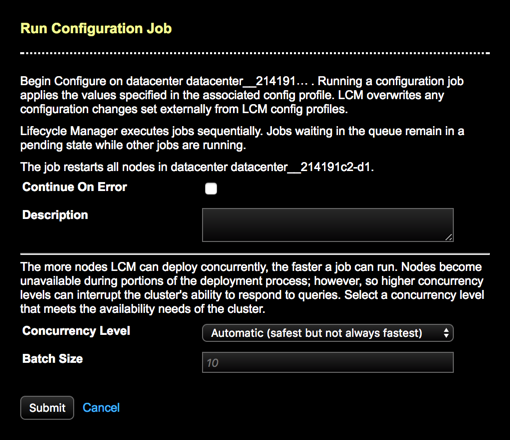 Running a configure job realigns and ensures uniform configuration. Note: If the version of DataStax Enterprise associated with a configuration profile being pushed differs from the installed version, the configuration job fails. To upgrade to a minor DSE version, clone the configuration profile and run an upgrade job. Lifecycle Manager runs jobs concurrently for different clusters; however, jobs for the same cluster execute sequentially and remain in the pending state while other jobs are currently running. The job does not progress to the next node until the current node successfully restarts (that is, the node is responding on the native_transport_port). By default, the job stops prematurely if a job fails for a single node, to avoid propagating a faulty configuration to an entire cluster. Jobs that are already running on nodes are allowed to finish, but the job does not continue running on any remaining nodes for that job. Doing so prevents any potential configuration problems from bringing down multiple nodes, or even the entire cluster. If required, override this default behavior with the Continue on error option, which attempts to continue running the job on all nodes regardless of failure. Create all SSH credentials and define repositories. Build the cluster topology model or import an existing model. Check the clock drift rule in the Best Practice Service to ensure clocks are in sync before proceeding. Clock drift can interfere with LCM generating TLS certificates. Run an installation job for the initial installation of DSE. Note: If importing an existing cluster into LCM, run an install job after the import. A configuration job fails if an install job has not preceded the configuration job. Click the ellipsis icon and select Configure. The Run Configuration Job dialog displays. If running a configuration job on a cluster or datacenter, enter a Batch Size if the default (10) is not appropriate for your environment.